The future of our communities depends on great public schools. Our local school boards make critical decisions that affect our children and families and have long-term impacts on our community’s economic strength. We encourage everyone to participate in our democracy and get out and vote in the upcoming school board elections in Bernalillo County, Santa Fe and Las Cruces on February 7th. Election Information: Polls open on February 7th and are open from 7:00 am to 7:00 pm. Early Voting Information: You can early vote Monday thru Friday, February 3rd. Albuquerque Public Schools (APS) and Central New Mexico Community College (CNM). On Tuesday you can vote at ANY of the 32 voting convenience centers in BERNCO. Click here to view a downloadable/printable list of Voting Convenience Centers. Find your APS District and see your personalized sample ballot on Bernalillo County’s My Voter Information. On Tuesday, you can vote at ANY voting convenience centers in Santa Fe. Call (505) 986-6280 to find the one nearest you or view the list of Voting Convenience Centers. To view your sample ballot visit 2017 School Sample Ballots. On Tuesday, you can vote at ANY voting convenience centers in Doña Ana. For a complete list of Voting Convenience Centers, go to Doña Ana County Elections. Early voting is happening at the Dona Ana County Government Center, Room 111, 845 N Motel Blvd, Monday thru Friday, 8AM to 5PM. What’s wrong with this picture? Voters waiting in line for hours to vote in Chaparral and Rio Rancho. Hard-to-update, inaccurate paper-based voter registration systems. It’s little wonder that New Mexico’s voter participation rate is so disappointing. Our elections should be free, fair and accessible to all New Mexicans. What does Intel in New Mexico have to do with the student loan debt crisis? Take it away, Sarah. Sarah Kennedy had quite a week all right. She catches us up on how Bank Transfer Day went down in New Mexico (It was a winner!) and does a bit on the crushing impact of student loan debt (Help is on the way!). 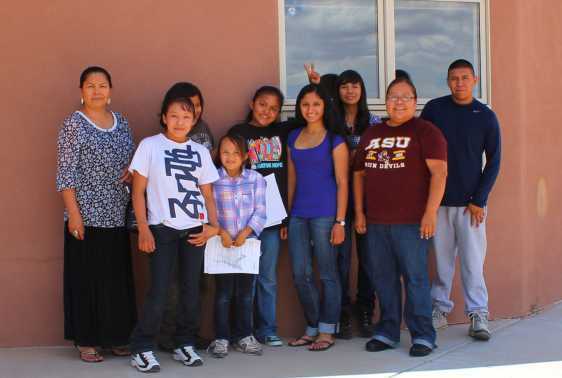 Tohajiilee, NM – When you hear Waverly Yazzie speak about her dream of having empowered youth in her community leading efforts to improve Tohajiilee, you would probably guess that she is far older than twelve. Indeed, Waverly is a 7th grader from the Tohajiilee community of the Navajo Nation who is spearheading efforts to create the Tohajiilee Youth Council. 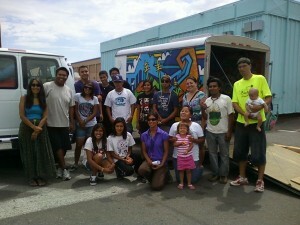 Members of the Tohajiilee Youth Council take a break from a planning session. Waverly is the 3rd from the right. And this week, Waverly, her mother Dee Apache, and other members of the Native Health Initiative will head to Washington D.C. for the annual meeting of the American Public Health Association (APHA) to hear Waverly speak about the importance of youth leadership in health efforts. Waverly’s presentation, “Youth Leading the Way to Healthier Communities” will allow her, at twelve years of age, to present to public health leaders from across the country. Roving reporter Sarah Kennedy sends in this special report. Albuquerque, NM – The youth took a collective deep breath, and as Arlyn John began to sing a traditional traveling song, the cars and other noises of the city seemed to fade away. For many, the journey they were about to begin, biking from Zuni Pueblo to Taos Pueblo, is the biggest trip of their lives. The Cycles of Life program chose this route for their healing ride, using the same route that Coronado’s army took centuries ago when the goal was the destruction of Indigenous communities. Arlyn (Dine’ – Zuni clan, born for Tangle Water), a teacher of personal wellness at the Native American Community Academy (NACA), who also coordinates the NACA Conservation Corps (CC) summer program similarly breathed a sigh of. Weeks earlier he was looking for a program for his CC students, and came across the Cycles of Life Program. “It seemed like a great fit, a way to connect taking care of yourself and taking care of our Earth,” he recalls. We are learning first-hand the power of critical thinking linked with action through, taking an indigenous perspective on health and education,” says Jake Foreman, the program’s creator. “We are creating a space that supports, encourages, and strengthens youth to realize their innate potential as compassionate leaders for our Mother Earth through service, exercise and exploration of our local community.” In addition to learning bicycle maintenance and working to build bikes that are “funky and fresh” the youth have learned how to make traditional-style waffle gardens, did an energy audit on a local building, and learned more about green energy initiatives in our region. The inspiration for creating a summer program for indigenous youth that connects bicycling, gardening and art came from my personal understanding of the interconnectedness and impermanence of everything on our planet. A profound lesson of impermanence came when my father passed away last spring. Cycles f Life ran off ‘loving service’ and lots of committed partners, says Jake. Entities involved in the Cycles of Life Program include community members in the Zuni, Laguna NACA and the NACA Conservation Corps, NM Game and Fish, the Sierra Club, UNM CLPS Program, Molina Healthcare, the Native Health Initiative, and Instituto Sostener. Albuquerque – Empowered youth, hot summer sun, paintbrushes and the north-facing wall of the Albuquerque Center for Peace and Justice. These are the ingredients of an ambitious mural art project that contrasts iconic images and struggles with their modern-day counterparts. The goal is to tell “ourstory”, the heroes, events, and cultures of New Mexico often forgotten in textbooks. Liz Carrasco and Lillian Fernandez, two college-bound youth interns with the SouthWest Organizing Project (SWOP) came up with the idea of the project through conversations with fellow SWOP youth. Taking a break from the mural work being done outside, I had the chance to sit down with both students on the first day that the project began. We envision the art as a space to come together as a community and represent who we are,” says Liz, a graduate of the South Valley Academy who is headed to UNM to study political science. Lillian sees the project as an extension of her love for art. “I think that this project, led by youth activists and artists, shows the power art has to improve our world.” A graduate of Nuestros Valores High School, she will be attending La Sierra University in Riverside California, planning to become a veterinarian. 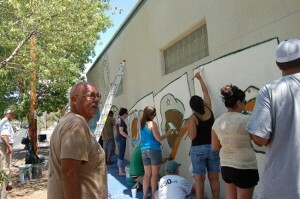 “The mural is going to have images that you would not normally see together – the Virgin de Guadelupe reaching down to help a mother in need, an Aztec dancer who is break dancing…we will have freedom fighters from the past such as Dolores Huerta, Jeanne Gauna, and Geronimo alongside our struggles of today, such as the Statue of Liberty and a family on their knees, both detained by immigration,” says Liz. Curious to hear about how the project got started, I asked them to explain. 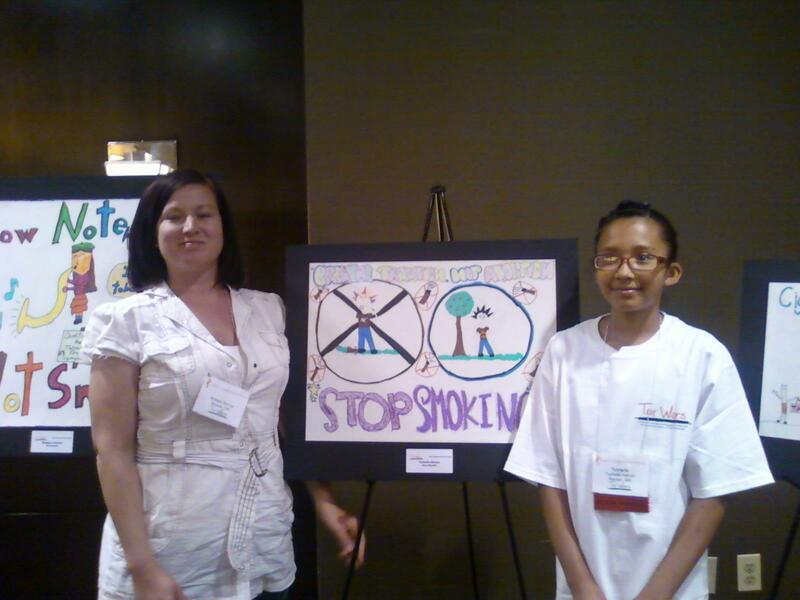 Breathe Tradition, Not Addiction: Youth artists bring the message! 3,500 youth will light their first cigarette today. 1,000 of these will become regular smokers. 350 of this group will eventually die from tobacco related illnesses. But this article is not about that group, nor is it about more depressing statistics around the biggest preventable cause of death in our country. 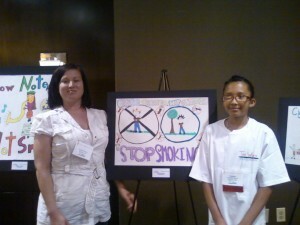 Here, we want to introduce you to two youth champions who are working toward a world without smoking. This past week, Joel Ladon and Tychelle Herron from Ramah, NM travelled to present their Tar Wars posters in prestigious settings, at the New Mexico Academy of Family Physicians (NMAFP) annual seminar in Ruidoso, and at the national Tar Wars conference in Washington D.C., respectively. Tar Wars, a national program to teach 4th and 5th grade students about the harms of smoking, holds a poster contest where youth create anti-smoking advertisements. In NM, a partnership called the Native Health Initiative (NHI) helps the NMAFP run the Tar Wars program and poster contest. NHI has added a twist to the program, incorporating the traditional/ceremonial/medicinal ways that tobaccos are used into an anti-smoking curriculum. “When we hear educators talk about being tobacco-free, as Dine’ and as Indigenous people, we may be confused, since traditional tobaccos are so important to us as people,” comments Shannon Fleg (Dine’) who is a health educator with NHI who came up with the Breathe Tradition, Not Addiction campaign. “We decided to take a big step this year and work on getting our poster winners to receive bigger recognition for their work,” says Andrew Goumas, an NHI Coordinator who helps coordinate the Tar Wars NM program. Tychelle and her mother stand by Tychelle’s poster in the “Parade of Posters” at the national Tar Wars Conference in Washington D.C.
Tychelle represented New Mexico at the Tar Wars Conference, where one youth winner from each state was picked to attend. Her poster was titled, Breathe Tradition, Not Addiction and was the only one at the conference that incorporated traditional tobacco.